Real Techniques Starter Brush Set! 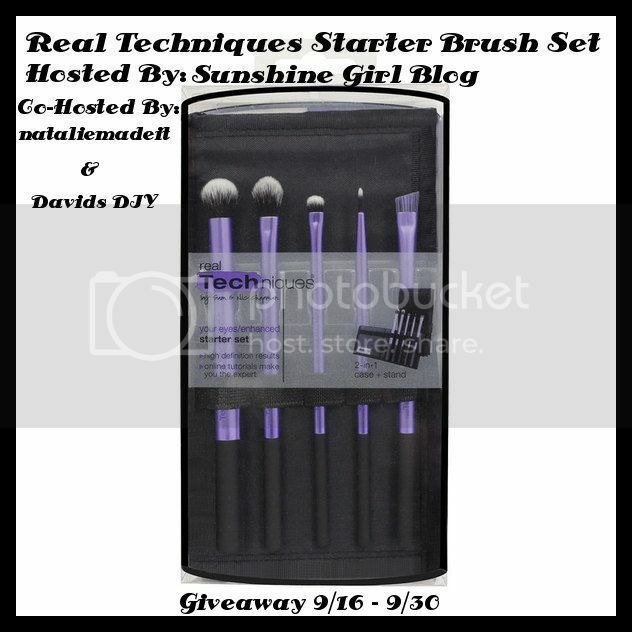 One Lucky Winner will receive a set of Real Technique Starter Brushes valued at $20.00. A Huge thank you so very much goes to all of the great bloggers working on with me on this giveaway. You are greatly appreciated. If you're looking for Eye definition that goes high definition look no further then the revised Real Techniques Starter Set! Brow brush: distinctive shape easily defines eyebrows. Now for the fun stuff! Please remember there are Bonus Daily Entries for sharing this giveaway on your social media. I can not ask you to "Like" our pages for a giveaway entry when visiting but is you see something you like please let us know so we can bring you more of it. We LOVE it when you LIKE our pages. If you have any questions or are a brand/company and would like to work with Sunshine Girl Blog please contact us here. Thanks for visiting Sunshine Girl Blog! Leave Some Comment Love While You Are Here! Winner(s) are subject to eligibility verification. Winner will be contacted by email and will have 48 hours to respond before a new winner is chosen. This event is in no way administered, sponsored, or endorsed by, or associated with, Facebook and/or Twitter, Google, Pinterest, or any other social media outlet. Giveaway ends at 11:59 p.m. (EST) on September 30, 2015. Giveaway is open to residents of the United States age 18 and older. All entries are optional unless otherwise indicated. Any entries that are mandatory will be clearly marked as such. Contact sunshinegirblogger@gmail.com if you have any questions, concerns, or comments.